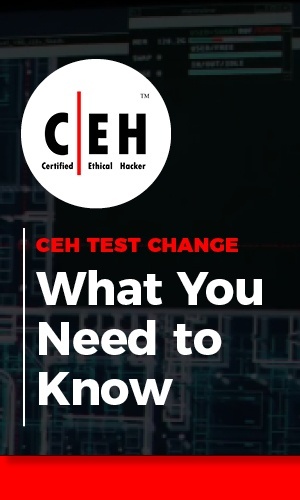 EC-Council, the certification body behind the Certified Ethical Hacker (CEH) certification and exam, recently released an updated CEH exam blueprint. This new blueprint, effective November 1, 2018, has implications for CEH hopefuls. Register for this video overview to watch the latest on these changes and how they may affect you, your studies, and your overall test day experience! Keeping track of all these test-maker changes can be confusing and challenging. CyberVista, a premium cybersecurity training and workforce development company, works diligently to ensure all our training content adheres to the updates both in courseware and exam blueprints. When you enroll in a CyberVista training course, we’ll tell you exactly what to study and which content to prioritize. You can focus on your studies having confidence that our content and instruction is reflective of the latest exam priorities and objectives. Simply put, we deliver cyber training. Reinvented. To register, simply submit the form. Instructions will be sent to directly to your inbox.